The apartments are located in the center of Franciacorta in the municipality of Monticelli Brusati, in a hilly position, in a private park, surrounded by vineyards, locust woods, chestnut and olive trees. Very nice spacious apartments with exposed beams, ideal for copies, and families with children. The area, ideal for lovers of nature and tranquility, is only 7 km from Lake Iseo. You can buy honey and oil of own production. In the surrounding woods, there is the possibility of gathering berries, mushrooms, chestnuts. We are in a good place to visit the Franciacorta, its cellars and the characteristic villages. A few miles away is Lake Iseo and Monteisola, the largest lake island in Europe. In our house you have the opportunity to stay in the two apartments furnished with style and taste by the owners: MINIMUM STAY 2 NIGHTS ...... The daisies: - 60 sqm apartment on the ground floor, suitable for 2/5 people (with the possibility of adding an extra bed). - Composed of a living room with a double sofa bed, a fully equipped kitchen with a dining area, a double bedroom, a large bathroom with a shower and a washing machine. - Entrance is independent, large private parking outside. - In the summer, guests can use the large porch to have lunch and relax. Water Lilies: - 60 sqm apartment on the first floor, suitable for 4-6 persons (with the possibility of adding 1 cot). - Composed of a living room with a double sofa bed, a fully equipped kitchen with a dining area, a double bedroom, a large bathroom with a shower and a washing machine. - Entrance is independent, large private parking outside. - In the summer, guests can use the large porch to have lunch and relax. Each apartment has independent services, a kitchen, a living room with a double sofa bed, a double bedroom, a bathroom with a shower or bath, a washing machine and a private car park. We stayed two weeks with Chiara and her family and were treated just like family. This is a wonderful spot at the top of the community, surrounded by mother nature. We awoke to hear the birds singing. We made day trips to Brescia, Bergamo and beautiful Lake Iseo. If you want a genuine Italian experience, this is the place for you. We have been traveling in Italy and renting places through VRBO and this one ranks near the top. Because the place is a bit off the beaten path, a car would be recommended. I took many walks in the wooded hills above our digs, including a couple to a nearby waterfall. The best restaurants we found were at Iseo at the lake. La coppia é molto educata, simpatica,gentile, facile la comunicazione. Conoscono molte lingue tra altro anche italiano. Hanno tenuto molto bene la casa. House is clean, comfortable and well equipped. There was no problem with coming or leaving too late/ early. The place is very quiet- ideal for the rest. 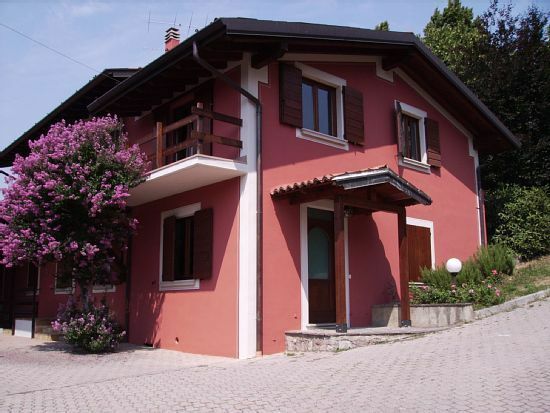 Location is great as well- Iseo lake nearby, also we went to Lake Garda and Verona. The owners are very nice and friendly people and honey just amazing! I have left my phone as I was going home. The owners has contacted me and kindly send it back. Sono felice che avete passato una bella vacanza,avete potuto visitare alcuni posti del Italy . Sono molto contenta che il posto vi è piaciuto molto. Mi è spiaciuto che partendo molto presto ,avete dimenticato oggetti personali. Se venite in Italy , se passate ,venite a trovarci ,anche solo per un saluto. "La casa es comodísima y en un entorno natural privilegiado muy traquilo e ideal para el descanso. Muy bien situada para visitas turísticas. Lo mejor, los propietarios, amables y excelentes personas, que hacen la estancia más agradable. Muy aconsejable." "Une famille très accueillante, prête à rendre service et ce malgré la difficulté de la langue. Des produits de leur production miel, vin, huile d'olive. Le logement correspond à la description, propre, bien équipé. Situé au milieu des oliviers et des vignes dans un endroit calme avec une vue sur les forêts magnifique. Nous y avons passé 15 jours très agréables. Si vous allez dans la région des lacs en Italie arretez vous-y. "Los propietarios son personas muy agradables que te hacen sentirte cómodo en todo momento y están atentos a tus necesidades. El lugar es muy bonito y bien situado." "Famiglia squisita, accoglienza ottima, ottime informazioni per escursioni, ottimi anche il miele e la marmellata. L' appartamento risulta confortevole e molto pulito,facile la manutenzione giornaliera. L'agriturismo è facilmente raggiungibile grazie ai bei cartelli gialli che lo contraddistinguono. Noi ci torneremo di sicuro."